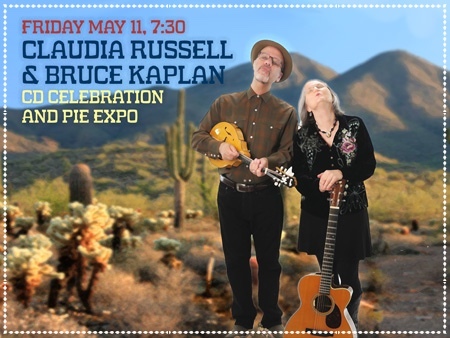 Join us May 11 for the Claudia Russell + Bruce Kaplan CD Celebration! Our favorite folk duo performs all the songs from their brand new CD. Plus there will be PIE! One of the Bay Area's most eclectic and dynamic Americana duos, Claudia and Bruce traverse a wide Americana landscape, stopping at musical landmarks along the way, tipping their hat to bluegrass bands, blues divas, jazz cats, Village folkies, and singing cowboys. Driven by Claudia’s expressive voice and distinctive guitar style, plus Kaplan’s melodic accompaniment on mandolin, banjo and electric guitar, it all comes together beautifully. It's all served up with a generous helping of homespun humor and shaggy dog stories, making for a heartfelt and humorous evening of deeply engaging music. Sing Out magazine has hailed Claudia as “a great live performer" while American Songwriter says "Claudia Russell is a gifted songwriter with a gorgeous singing voice." Russell and Kaplan have toured across the country, performing in living rooms, barns, churches, and coffee houses as well as festivals including Kerrville Folk Festival, Boston Folk Festival, the New Bedford Folk Festival, Black Hawk Folk Festival, and multiple concert appearances at legendary venues such as McCabe’s, Club Passim, and Berkeley’s Freight & Salvage. Come join us at intimate and awesome Point Richmond Acoustic, held at the beautiful FIrst Methodist Church of Point Richmond, 201 Martina Street, Point Richmond. Note: The offical realease date is July 1. Though the final release edition will not be available at the concert, Claudia and Bruce are working hard to make a speical digital edition available at the show. Stay tuned to their Facebook page for up to the moment information. So, what about the Pie Expo thing? Well, here's the story: If you bring a HOME-MADE pie, made by you, along with a list of ingredients, you can get a free ticket and we'll share the pies at the intermission. This offer is limited to the first 10 pie makers and special FREE tickets must be purchased online. One free ticket per pie baker. It's going to be an evening of delicious music and delicious pie. We hope you'll join us! Copyright © 2018 Radio Rhythm Records, All rights reserved. You're on our list because you signed up for our list at a show or from our web site.